I have always been fascinated by Egyptian history. I can remember roaming the exhibits of the Smithsonian several times in utter awe. I love watching National Geographic specials and learning about the culture, artifacts that have been recovered, past rulers, and the belief system. In The Secret of the Sacred Scarab, written by Fiona Ingram, Adam and Justin, two cousins from South Africa, are headed to Egypt for a family vacation with their aunt and grandmother. The boys are eager for adventure and they do not have to wait long before adventure and mystery find them. Once a peddler slips a sacred object into Adam’s pocket, a whirlwind of mystery and danger begins. Adam and Justin learn quickly that Dr. Faisal Khalid is willing to do anything to obtain the sacred scarab. As they travel to various destinations, Adam and Justin learn more about the scarab and why it is so important. The Secret of the Sacred Scarab is a wonderful adventure and reminded me so much of the Nancy Drew and Hardy Boys mysteries that I read as a young girl. I believe this book could be used by teachers as a supplement to curriculum on Egypt. Educators know the importance of engaging learners, particularly through the use of books, and I definitely feel that this book will take hold of students’ interests. I was so pleased to learn that the author has completed the next book in the series. I look forward to reading more about Adam and Justin’s adventures. 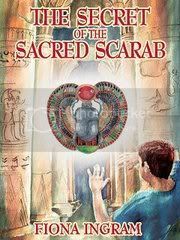 The Secret of the Sacred Scarab can be purchased on Amazon and Barnes and Noble. Follow Fiona Ingram on Twitter and Facebook! Fiona Ingram currently lives in South Africa. She has been a freelance writer for fifteen years. Fiona began telling stories at a young age in order to entertain her three younger brothers and their friends. The Secret of the Sacred Scarab was created after a trip to Egypt while accompanied by her two nephews. You can read more about Fiona Ingram’s background on her website and her blog. *Disclaimer: I did not receive monetary compensation for this post. I received a free copy for the purposes of this review. The opinions expressed here are my own. Thank you for sharing about Fiona Ingram and her wonderful book series. This sounds like an interesting book. I may have to start reading it! Vistaprint - 140 Free Labels! - 1 day only! Spooky Buddies DVD/Blue-Ray Combo Giveaway!